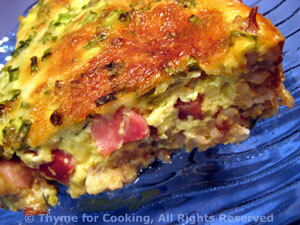 Thyme for Cooking's Main Courses: Lemon Snapper, Chicken, Quiche. Add 1 tbs lemon juice, tarragon and thyme to butter. Brush on fish fillets. Bake, 400F (200C), for 15 - 20 minutes, until fish is done. It should be opaque and flake easily with a fork. These are easy to make: slice a pocket, fill and tie. 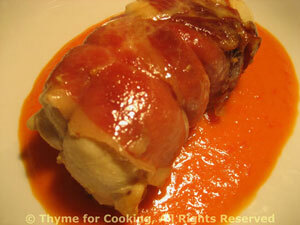 The Prosciutto wrapping infuses the chicken with flavor and helps keep it moist. The Pimiento Sauce adds just a bit of spice to it. With a sharp knife make a long slit in the edge of the chicken breast - cutting horizontally and being careful not to cut through the other side. Make the cut on the 'straight' edge of the breast. You should have a pocket the shape of the breast with 1/2 inch of 'uncut' chicken around 3 sides. Tuck the sliced cheese inside. Lay 2 slices of Prosciutto side by side. Close the chicken breast and lay it on the Prosciutto at a slight angle, Roll and wrap, covering the chicken breast completely in the ham, as best you can. Wrap the entire parcel with kitchen string to hold it together - and keep as much cheese inside as possible. Heat oil in a medium nonstick skillet over medium heat. Add chicken and brown well on all sides, about 10 minutes total. 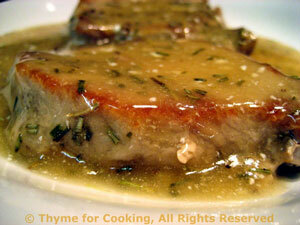 Reduce heat to low, cover and let finish cooking, another 10 - 15 minutes. Put pimiento/pepper, garlic powder and chili powder into a blender. Purée, adding as much stock as needed. Pour into a small saucepan and stir in tomato paste. Gently heat until it starts to simmer. Remove from heat, stir in yogurt and cover to keep warm. Remove chicken from heat. Snip the string in a few places and remove. 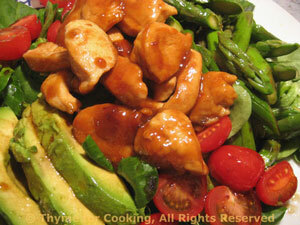 Spoon some Pimiento Sauce onto the plates, place the chicken in the center and serve, any remaining sauce on the side. Ham and asparagus are surely one of the food world's more perfect pairings. Snap off asparagus ends. Peel if using white. Cut asparagus into 1 1/2" (4cm) lengths. Add asparagus and boil for 3 minutes (4 for white). Cut ham into large, bite-size pieces. 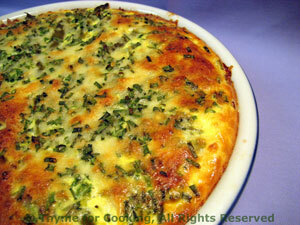 Trim and thickly slice green garlic or onion; mince garlic if using. Heat oil in a nonstick skillet over medium heat. 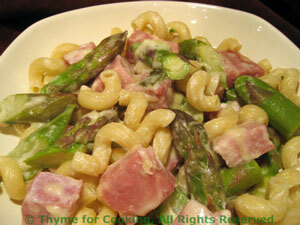 Add green garlic /onion and garlic, ham, asparagus and sauté until hot and lightly browned. Add chicken stock and heat through. When pasta is done drain and add to skillet; heat through. 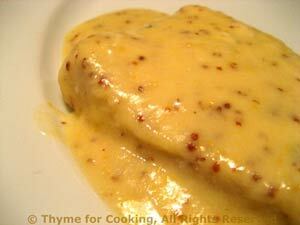 Sprinkle with cheese, stir to combine and melt cheese slightly and serve. The rice makes a lovely crust, much healthier than the traditional pastry... and easier too, especially if you cook the rice earlier. Cook the rice in stock. If doing in advance, refrigerate until needed. If doing now, spread the rice on a plate to cool for 5 minutes before making crust. Mix cooked rice, cheese and egg. Pat into a lightly oiled quiche or 10" (25cm) pie plate, working it up the sides a bit for the edges. Heat oil in nonstick skillet and lightly sauté pepper strips. Whisk 3 eggs, yogurt and milk together. When crust is done, remove from oven. Spread the pepper strips evenly over the crust. Spread the ham on top. Pour egg mixture over all and bake, 30 minutes, 400F (200C). Remove from oven and let rest 5 minutes before cutting.